| The Catholic Right, Part Six: Has Anyone Seen Bill? ...A video game that is set in post-Rapture New York City, where Roman Catholics are among those "left behind," described as non-believers and must choose to either become born again Christians or perish at gunpoint. A game which, by the way, is being marketed directly at 14 to 34 year-old male Christians and has been marketed through several Evangelical mega-churches. 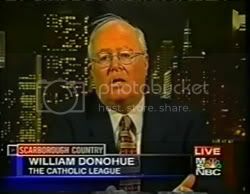 The idea of raising a generation to believe that Catholics (as well as other people of faith) who do not embrace an exclusionary form of Protestant fundamentalism are nothing more than fodder for damnation should get Mr. Donohue's blood boiling. As of 9:00PM, June 24, 2006, a Google search has revealed that the Catholic League has not even uttered a peep about Left Behind: Eternal Forces. There is nary a word from the usually pugnacious Donohue on the Catholic League's web site , in its periodical Catalyst, nor any sign of a bombastic press release on the matter. Admittedly, Google searches are far from definitive and perhaps Donohue said something somewhere about the game. But if he did, it was not done in a way that was calculated to inject a splashy condemnation into the mainstream press--or in other words, he did not follow standard Catholic League procedure. What makes this non-response odd is that Donohue is a Catholic who maintains his base of operations right there in the Big Apple. Chip Berlet, and others have identified the anti-Catholicism rampant in Tim LaHaye's message. While LaHaye's series is clearer about who gets left behind than the video game, the fate of Catholics is easily discernable to the player who has done his reading. The game has New Yorkers who display no religious identity. But taken within the context of Tim LaHaye's anti-Catholic allusions found throughout the Left Behind volumes (for instance, the Cardinal of Cincinnati who does not disappear in the rapture, but speaks of family members who did--noting how unlike him, they had left the Catholic Church), aficionados will have no problem filling in the blanks. What faith do you suppose those nameless and faceless characters around St. Patrick's Cathedral belong to? And it is not as if people aren't talking about this game. Talk to Action's Jonathon Hutson has been doing a tremendous job exposing the story behind this technological work of religious bigotry. Time's Andrew Sullivan has picked up on it, as has The Los Angeles Times. While Bill ignores this blatant piece of hate he can still be found railing at straw man issues that better arouse hatred for progressive ideas. In William Donohue's universe it is seems to be more urgent to describe gay people as "deviant" than to condemn a video game that sends the message it is perfectly fine to kill Catholics as well as other non-Evangelicals in the name of Christ. I'll hazard a guess why Donohue hasn't spoke up about Left Behind: Eternal Forces: As I contend in part four of my series on the Catholic Right, Mr. Donohue's agenda is more interested in rendering onto Caesar than rendering onto God. If he were to speak out on this issue, he might risk alienating some of his Justice Sunday friends among others on the Religious Right. In other words, it seems that Bill is putting his religious right political agenda before truly defending Catholic religious and civil rights. And if I'm correct, it will further underscore the foundation of hypocrisy the Catholic League is built upon. Pure and simple, Left Behind: Eternal Forces is predicated upon the same Ku Klux Klan-style bigotry that was flung at Al Smith in 1928 and John F. Kennedy in 1960. This is old-fashioned hatred, with no abstractions to argue over. It is anti-Catholicism in one of its purest forms and as pure as it has been in years. But knowing all that we now know about the Catholic League and with such a clear example of anti-Catholicism in plain sight, is it really any wonder why Catholics must ask, Where's Bill? Since the Left Behind:Eternal Forces discussion has begun, I have been looking forward to hear comments from Christianity Today. A center for Evangelicalism, CT many times has balanced and informative criticism and is not afraid to expose their own when they deserve criticism. So far not a word of evaluation on this game, which I would assume they would find ethically lacking. Makes one wonder how much influence Tyndale House, CT's neighbor, might have over CT, considering all the advertising revenue that is involved. I'm disappointed. What sayeth a single Christian publication of any flavor in the United States? It is early yet, and I am patient. The media in general have not yet picked up on this except for some early conveyor belt type "reviews" in the mainstream press that completely missed the ugliness that this game represents. As Frank, Chip and Jonathan and many others have pointed out, the "values" of Left Behind the novel series and the game are horrific -- and warrant condemnation and active opposition by people of all political and religious persuasions. Good lord, they went after Dan Pilarczyk! Cinci has no cardinal but it does have an archbishop who is very influential. His region includes most of Ohio. His office of ecumenical and interfaith relations has a history of excellent interfaith dialogue. Lou Vera is their officer. Pilarczk must be a nasty burr under the saddle of the utlra right group in Ann Arbor. Boy, this gets closer and closer to home. Shortly before and I believe during the Civil War the Diocese of Cinncinnati was one of the most progressive in the nation. It was under the control of Bishop Purcell who openly bashed slavery and assisted those fleeing captivity via the Underground Railroad---a pretty gutsy thing to do just across the river from Kentucky, which was a save state. Did anyone tell the clowns that created this video game that Michelangelo, you know the guy who painted the Creation panel in the Sistine Chapel and featured so prominently in Left Behind: Eternal Forces, was a religious Roman Catholic who worked at the pleasure of Pope Julius? So, instead I chose to fixate on the fact that the "Left Behind: Eternal Forces" movie trailer showed God ( and Adam too, if that was Adam ) wearing boxer shorts. Boxer shorts! Not only do the attack Catholics, but classic art! was very likely a gay religious Roman Catholic, at that. But Shhh! ... don't tell Bill. Thanks again, and I wouldn't count on the Left Behind folks to know squat about history. ...knowing that the message reaches good, decent folks like you makes it all worth the effort.